The program for the 2019 Conference on “New Frontiers in Banking: from Corporate Governance to Risk Management” is now available. The conference, which featured a dual submission option with RFS, will take place March 29-30, 2019, at Bocconi University in Milan. The program may be viewed here. The current and former Executive Editors of RFS, Professors Itay Goldstein and Andrew Karolyi, were interviewed on the Knowledge@Wharton show on SiriusXM about the RFS FinTech initiative. You can listen to the interview and read the related article here. The RFS-NBER Conference on Big Data: Long-Term Implications for Financial Markets and Firms took place March 8, 2019. 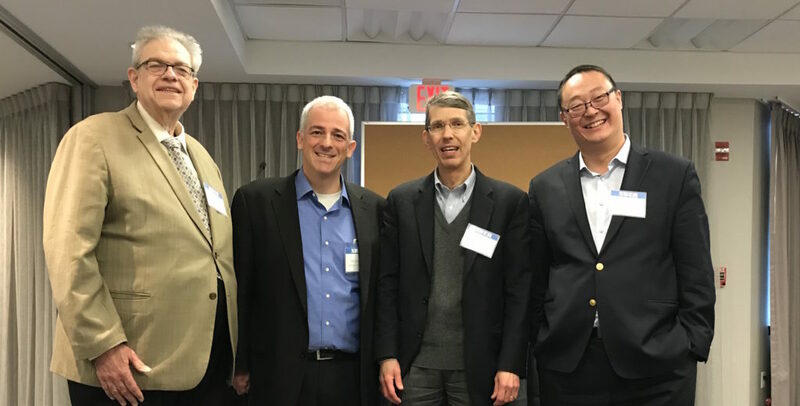 Pictured are the conference organizers and host: Chester Spatt (Carnegie Mellon), RFS Executive Editor Itay Goldstein (University of Pennsylvania), NBER President James Poterba (MIT), and Mao Ye (University of Illinois Urbana-Champaign). The 2019 University of Oklahoma Energy and Commodities Finance Research Conference will feature a dual submission option with RFS. The RFS sponsoring editor is Philip Strahan. The deadline for submissions is May 15, 2019. The conference will take place September 19-20, 2019, on the OU campus in Norman, Oklahoma. The Call for Papers may be viewed here.